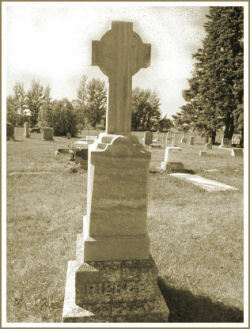 Grave marker of Edward Michell Pierce, founder of Cannington Manor, d June 20, 1888. For those seeking family connections to All Saints Cannington Manor, genealogical information will be posted to this site over time. We thank Terrance B. Sweeney who has photographed the grave markers and and made them available on the Find a Grave site.